Halloween is one of our favorite holidays. How could you not love Halloween? Candy, costumes, crisp weather, fun with friends! It’s the best. Since it’s on the last day of October, we LOVE to decorate and celebrate all month long. 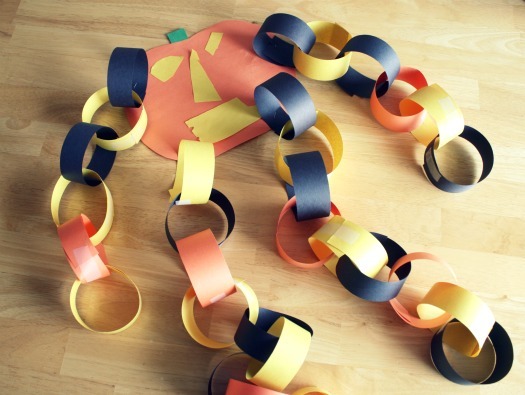 To help in this process, we’re counting down to Halloween with this awesome pumpkin paper chain activity and craft. 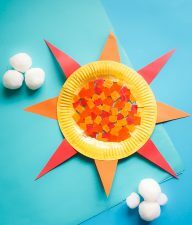 It’s easy enough even your littlest kiddos can join in on the crafting fun. 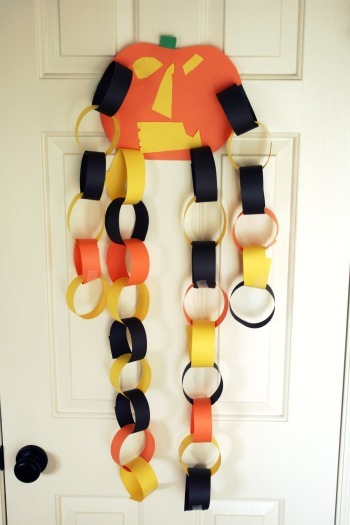 We made a classic paper chain counter, but turned it into a Pumpkin Paper Chain! 1. 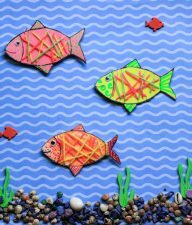 Cut your paper into strips. I just used construction paper. I don’t suggest using cardstock paper, it’s a little more difficult to curl and tape the paper. 2. Form a circle with one strip and tape it closed. Loop another one through and tape, making them chain together. 3. 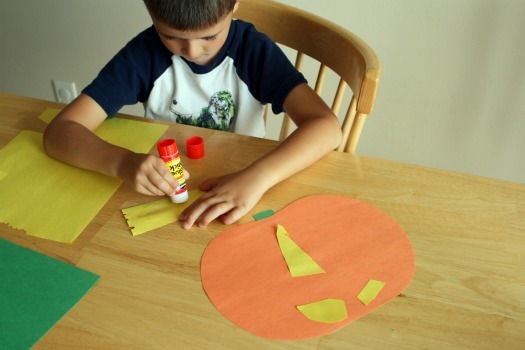 Now decorate a pumpkin face for the main body of the counter using your paper, scissors, and glue stick. I stapled the arms and legs onto the paper pumpkin. You could tape or glue these on, but we need them to last for a whole month and staples are a little more durable. Display your cute pumpkin paper chain somewhere visible for the kids (I used packing tape to tape him up on the door, it’s kind of heavy with all the chains). Or you can use painter’s tape or even add him to a nail you have in the house on a wall. NOW… on the first day of October, they get to tear off ONE chain, and so on until all you have is the pumpkin face on Halloween. Your Halloween pumpkin paper chain could be made into a ghost of white paper chains, witch’s hair with green paper chains, or even a cute garland paper chain under the mantel. 1. Make the witch face: Cut a large triangle out of the black paper for the witch’s hat. Then cut out a large green circle for her head. Glue the hat on top of her face. Add the googley eyes and a nose and mouth. We made a 3D nose by folding down one end of the paper and gluing the bent flap to the face. We also added a few warts to her nose! 2. Cut the witch hair: Cut 30 strips of paper using scissors or a paper slicer. We used green and purple paper and are making a fun pattern with them. We gave our witch two strands of hair on each side of her face, but you can make her hair go any way you’d like. 3. 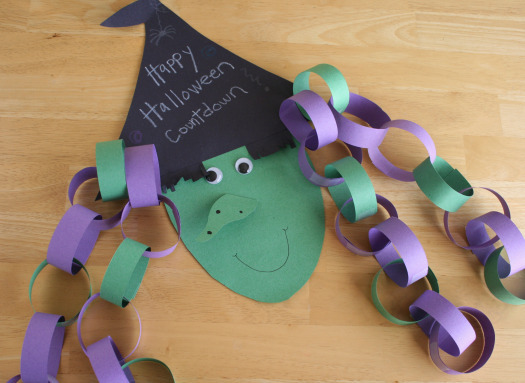 Add the witch hair: Create a circle with each slice of paper, adding them to each other, creating a paper chain. 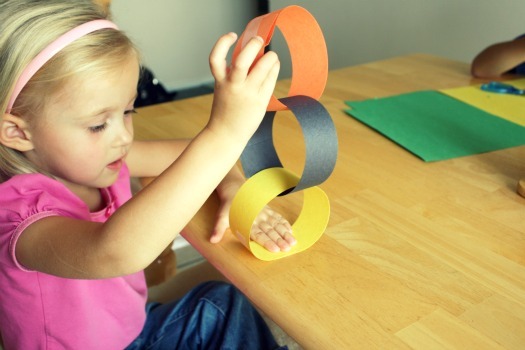 I like to attach these paper chains with tape, but you can use glue or even staples. We made 4 chains – 2 with 7 chains and 2 with 8 chains to equal 30 chains. Then the last day will just be the witches spooky face! With your white crayon, add in a fun message to her black hat! Now she’s ready to countdown to Halloween. 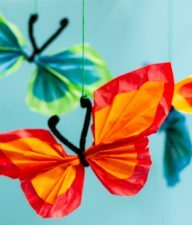 Either way you paper chain, it’s fun for the kids to watch as they get closer to the day of dressing-up and eating candy! This is so cute! For Christmas this year we’re making a countdown chain with activities written on each one – I think it will be fun to count down the days, and it will help keep us doing fun things and making memories as Christmas approaches. I’ll be posting about it next week. We made this a couple of days ago and my girls (4 and 20 months) LOVE it! I think we will make one for Thanksgiving too but attach them to a turkey. Such a fun idea!!! I am going to do this with my 3 year old! I love the idea! I used to do this as a kid for Xmas…never thought to do it for Halloween. Will do next year when my 2 yr old has a better understanding. I totally just bookmarked it! Love your site! Love this craft! The kids and I made it yesterday afternoon. We love Halloween and we’re excited to now be counting down. Oh my goodness!! love this idea. We’ll have to make one next week, when we don’t have so much going on. 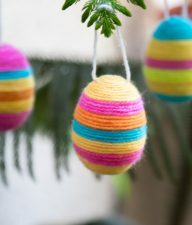 Cute idea!! Oh that is so stinkin cute! Great idea!! I am so stealing it! Marie, you are a GENIUS, i tell ya! 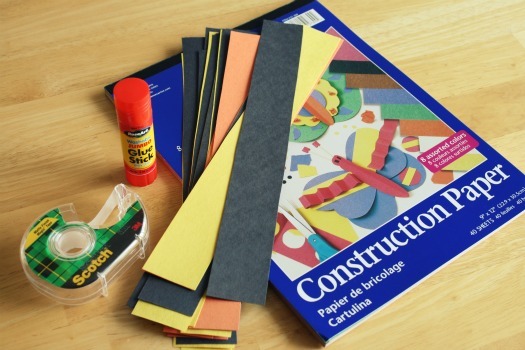 I love that idea Marie…looks like an easy enough craft I can do with Ben! It was fun to see you the other night! So cute. Going to do that with my 5 year old this afternoon.